Entrepreneurship is a lot like falling in love. Its very easy to be infatuated. Breaking all the rules, going against convention, striking out on your own, master of your own destiny and all that. What’s not to… love? But like relationships, once you’re in one, it’s a whole different ball game. There are rewards sure, but you slowly discover that there’s also much work to be done. There’s two ways to go about this, you either quit when the going gets tough or you take your game up a few notches and soldier on. Most times that gets you to the good stuff. But as in love, most times it doesn’t. It’s a risk you have to be ready to take. 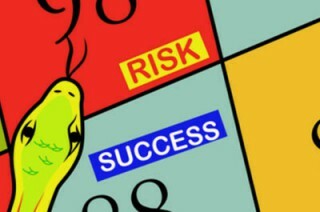 Entrepreneurship is risk. There’s no two ways about it. The risk of making one bad decision that can take it all away, the risk of choosing the wrong people to work with, the risk of putting all your eggs in one basket and the risk of allowing it all to affect your loved ones. Once you make up your mind, it can either be the most exciting time of your life or the most unnerving. In Nepali society, these risks can be tied to cultural stigma too. When Epic Bikes’ Rupesh Shrestha opened his now popular bike shop, the first question people asked him wasn’t about how fast his bikes could go. “Most people asked me ‘Why a cycle shop?’ Cycles were considered a utility item, a mode of transport for the lower classes,” says Rupesh. “When I left my residency/specialization in cardiac surgery and decided to run Health at Home, I faced lot of hurdles as society didn’t understand what we were offering. My family didn’t know what I was becoming and I didn’t know how to address myself as I was working as a nurse, a doctor, a compounder, an cccountant, a messenger, a driver, and a receptionist at the same time. I had a poem in my mind in my difficult days, by Robert Frost called ‘The road not taken’. The guiding star for my venture has been this poem,” says Dr Bishal Dhakal of the award winning social enterprise that provides medical care to people in the comfort of their own homes. When you’re walking on a footpath, it’s the simplest thing in the world; something you can do without barely thinking about it. Why is this? Because you started with baby steps (literally), learnt to walk proper and have been practising it every single day of your life ever since. What do you do when you falter, slip, or trip? You know how to regain your balance. Now take the same mundane task and change its setting to crossing a deep gorge by walking across a barely wide-enough plank of wood. Nerve racking right? How did something you could do blindfolded suddenly become such a challenge? Why are you worried about falling? Fear of death, common sense, afraid of heights, yes; but mainly because you’re not prepared! You don’t know what you would do; you don’t have a contingency plan for whatever could go wrong. This state of unpreparedness is what allows risk-taking to become such a big deal. There are things you can do to reduce its effects though. Perform a risk analysis: What can go wrong? What are your strengths and limitations? How will you handle the 10 likely issues you might have to face? Make a contingency plan beforehand so that you avoid surprises. “The fact that I had a financially stable family allowed me to take some of the risks that I took when I quit Party Nepal,” says mountain biker and tour leader Mandil Pradhan. Keep accurate and timely records: Rupesh Shrestha of Epic Bikes knows the pressures of taking a loan from the banks and of the interest that can accumulate really quickly. He runs a tight shift in terms of book keeping. “I have a mechanism in place where because I have great personal relations with my clients, I give them early deadlines for collecting pending payments,” he says. Go for a business model with limited liability: This might not be possible for all kinds of companies. If it does apply to your company, transfer the liability by changing your working model or even outsourcing parts of the work. Get feedback from the customer and work on it: Starbucks is not a start-up but when they introduced payments for coffee through one’s smartphone using Square Wallet, they knew it had flaws. But they used the feedback from the client to tweak it every day until they got it right. Today, payments through the system amount to millions of dollars. Keep the passion alive: Having that passion for doing something new, creating something that you believe in was a motivator for grepsr’s Subrat Basnet too. It also allowed him to overcome some of the anxiety associated with risk-taking. Subrat and Co-founder Amit Chaudhary launched the ‘cloud powered web crawling’ software in January 2011 and with 35 big names including Getty Images and American Fortune 25 company Target as clients, they haven’t looked back since. “I was already running a tech-based outsourcing company and making decent money. When I decided to quit the company and start grepsr, my parents and my wife were concerned. But I never believed in the goals of the company that I was working for then. I always wanted to create a product out of Nepal that was for the whole world,” says Subrat. Have your support system intact: One of the most important factors to take care of while assessing risk and its effects is something that happens away from your workspace – at home, with the family. Entrepreneurs are notorious for having unbalanced family lives, even broken marriages and estranged relationships with their spouses. How do you make sure this does not happen to you? Rupesh included his then-fiance in on his plans from Day 1. “Because she knew my idea so well, she understood why I was doing it. She would help out at the shop, handle the cash. She had great PR skills too so her support has been instrumental in getting Epic where it is right now,” he says. Collect Data: Kathmandu (and other Nepali cities are the same) doesn’t have any structure in place for collecting important data that could help out entrepreneurs in decision making and planning. DIY – collect data from whatever sources you get and make sure you process it so that it transforms from just facts and figures to information you can use. When Nepali people talk about progress and development in the country, we love to blame our supposedly ‘backward’ culture for much of our limitations. We’re a shy people who don’t know how to take advantage of our unique geographical position we say. History proves us wrong; Nepal has always been a country of risk takers, and travelers, people who have thrived on moving away from their comfort zones. In short, Nepali people have always been entrepreneurs. After figuring out that there was a market for items like rice, precious statues and utensils, traders from Kathmandu’s rich Newar community carried these items along with factory products like textiles from Bengal, India to the high lands of Lhasa in Tibet. Our unique position between China and India allowed them to act as a bridge between trade in Central and Southa Asia, back in the 7th century BC. They were business-savvy enough to have Tibet agree on their coins being minted in Nepal. This allowed the Nepalis to control trade in the region. By taking large risks and venturing into new lands, traders earned an edge over other businesses in their community. Needless to say, their business boomed. Having such control in the regional financial market seems far-fetched today. The reality is that Nepali people took those risks and reaped its benefits. Now take the example of Nepal’s global ambassadors – the brave Gurkha soldiers, who for the sake of the financial security of their families back home, risked their lives to enlist in the armies of foreign countries. Their risks paid off too; not only did they send back money that supported their families and their communities, but as the first earners of remittance, they helped keep the country’s economy afloat. The lahureys are still a well-to-do community because of the risks their forefathers took. Youth from the Terai are arguably the single largest group of risk-takers in Nepal today. They travel far and wide, away from the comfort of their homes, to delve into various occupations in alien environments. From fruit sellers to repairing our quilts and pillows, their work exposes them to communities that aren’t exactly welcoming. These risks have paid off too. The Madhesi community now is a thriving part of our society. From performing the odd jobs that other Nepalis still think are below them, to competing fair and square with city folk at any level, in any sector, their contribution to Nepali society is immense. When Nepalis today talk about other Nepalis not taking risks, although they might be trying to imply that it’s a cultural issue, truth is, it only reflects personal limitations. Skepticism might seem to be a collective mindset but it really isn’t. “Its human nature to want to stay in a comfort zone, but the magic happens outside it,” says Anil Chitrakar, entrepreneur and recent author of Take the Lead – Nepal’s Future Has Begun. “When you have money to spare, the way you work is different. You’re relaxed and have the liberty of adopting a wait-and-watch approach. Your efficiency is lowered. But when you take a risk and take a loan, your entire approach to work changes. You put in more work and try to get more work done. You’re more driven,” says Rupesh. There’s a risk in doing anything. Even in regular jobs, there’s a risk of you getting fired for something,” says Manish Pandit, Founder of Vootoo Events and Co-founder of Trendsetters. Manish had a steady job in the US when he came back to Nepal, but after doing a little homework, he decided there was opportunity here. “Taking a risk does not mean just jumping into things without being prepared. In Nepal there’s so many external factors that affect risk, you just can’t afford to not take a risk,” he adds. 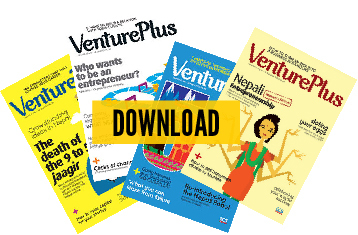 The entrepreneurs who’ve taken risks in Nepal, both now and back in the day, are live examples of the rewards it can bring your way. Its time more Nepali entrepreneurs today shake off pre-conceived notions and venture out, out of the comfort zone and into where the magic happens. A 4-point checklist for the entrepreneur in you. Why do you want to be an entrepreneur? If your reasons don’t add up, stop. There’s plenty of exciting jobs out there (some that might even allow meetings at a bar). Every role is important for a society to progress. If you are, get out. Entrepreneurship can be rewarding financially yes, but there might be quicker ways to make money. Besides, entrepreneurship requires 24/7, 365 days a year kind of passion. Don’t quit your job at the bank so quick. Are you prepared for the non glamorous part of it? Huge risks, inhuman working hours, multitasking, meetings, anxiety attacks, more meetings and very likely, an annoyed spouse—make sure you have what it takes to have that on your plate and still remain positive and creative.